I’ve just finished moving the Frogatto website, svn server, email, forum, etc. to a new server. Hopefully everything went as planned, but if you notice any problems, please let us know. If you had an svn checkout, please check the source page for instructions to switch to the new URL. If you’re that one person that posted on the forum after I copied the database: the answer is, there’s a door on the left about half way up (and please post again if that doesn’t help). If you notice the email isn’t working, twitter is a good way to get ahold of us too – or a comment here. We’ve added a long-standing omission, somewhat bizarre for how simple it is: signs. And yes, you can read the signs with that goofy “not really any real language” lettering on them, in-game. 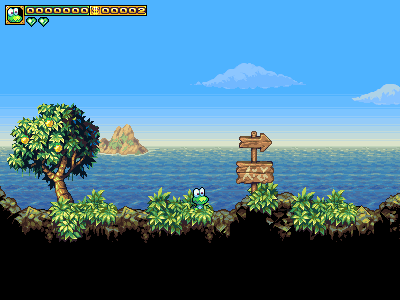 As you probably noticed in that picture, the colors are rather different from the usual palette in the seaside chapter of the game. 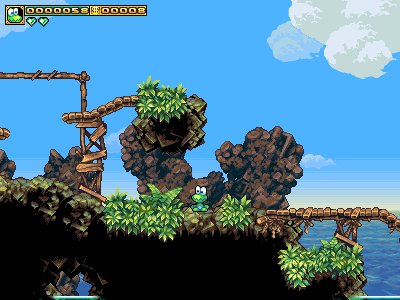 We’ve just added two new palettes to the seaside environment. Here’s another shot of that verdant/green one, and then a shot of the one being used in-town. As you can see in the above, I’ve also gone around and given all the houses some interfacing between the houses and the rock beneath them. You can consult current (~1.0.3 for future reference) screenshots for a comp, but the current seam is pretty nasty. The solution was not just a matter of drawing foundations, but a matter of drawing foundations with an irregular edge, and luminosity close to that of the rocks, so that it’s not immediately obvious where the house ends, and the rocks begin. It’s that subtle bit that I didn’t really have a grip on, before. 1] luminosity differences less than 10 become hard to notice, except on very large surfaces that are very gradually changing their angle of incidence towards the light. Differences below 5 are almost a sure-fire waste of a color, because a human eye, at (normal) pixel-art display sizes (which range from maybe 100-30 dpi) can’t really see these very well, and having more colors tends to lose the workflow benefits of pixel art. 3] One of those aforementioned “daring leaps” is behind much of the interesting variation in my palettes. Within reason, if you hold luminosity constant, you can change the chromacity of a palette element to practically anything (as long as you don’t go completely overboard with saturation), and more often than not, it will work. Even something insane like pink highlights on a green tree. It can help to have environmental justification (such as a blue sky causing blue secondary-highlights on a tree’s branches), but it’s amazing what still works even without that, as long as you still get the luminosity correct. 4] even in a dark scene, use a wide gamut, and just bend what photoshop calls the (luminosity) “curves” downward. Darks should still be very dark, brights, bright. It’s the stuff in the middle that should get bent downward, but without breaking the relative distances between each palette element. We just got a really nice review from these guys. 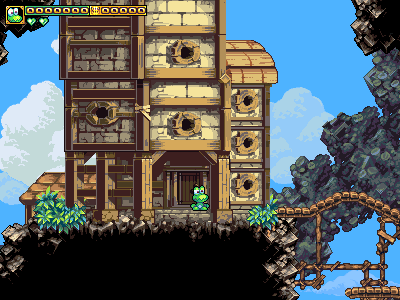 Besides feeling great about an overwhelmingly positive review, I definitely found myself agreeing with the guy’s main critique: Frogatto is way too easy for a grizzled platforming veteran. On the other hand, being easy opens us up to a huge world of people who for whatever reason just won’t (or even physically can’t) play an aggressive “nintendo hard” game. We’ve been thinking about how to solve that, and besides a risk of changing plans later and thus breaking a “promise”, there’s really no reason to keep our cards close to our chest. We’re most likely to do a series of tiered difficulty levels, like halo has; it’s tried, true, and does exactly what we want – getting an easy and a hard version of the game. You have the exact same levels (which eliminates an unbearable burden of trying to maintain two completely different level-sets, one of which would likely get neglected in testing), but there are major changes to the enemies on the levels. Not just more enemies, but enemies with much more aggressive twists to them. For example, imagine if our ants had the sense to turn around and dart towards you. Imagine if our kitties fired spread shots. Imagine if our flying ants did dive-attacks to intercept you. Little twists like this to the AI to make sections much more aggressive. Another thing would be lifting a few cues from an ancient mac game called dark castle (which recently had a remake you ought to check out, if you’re a mac user). Specifically, they had puzzles, very reminiscent of “myst”, which would expand their possibility space on the most difficult levels. The puzzles had additional twists on “hard” that made them more challenging.